Google Apps forever altered the landscape for many IT organizations. Instead of having to build and manage their own email infrastructure, IT admins were able to outsource it to Google. Instead of paying for and installing Microsoft Office, organizations were able to save a great deal of time and money by leveraging the Google Apps productivity suite which includes Docs, Sheets, Slides, and more. Instead of worrying about hosting and potentially losing data stored on-premises, their users were able to leverage cloud-based storage. All of these benefits were significant. Today, over 2 million businesses are leveraging Google Apps for Work. But it’s not all perfect. For many of these organizations, managing user access to Google Apps and other IT resources is a challenge. JumpCloud’s Directory-as-a-Service® platform features Google Apps provisioning and sync capabilities, enabling IT organizations to truly centralize their user management. Without JumpCloud’s virtual identity provider, a user’s GApps credentials are only utilized for Google Apps and a select few SaaS applications. A user’s laptop, their servers, legacy LDAP applications, and WiFi access all require different passwords and accounts. While users are frustrated with a lack of a True Single Sign-On™ solution with GApps, IT is worried that they are not able to control user accounts to all of the IT resources their users need. The benefit of a cloud-based directory service is that credentials are centralized and leveraged for just about any IT resource that users require. Better still, those credentials are the same ones used with GApps. Note: visit our KnowledgeBase for a step-by-step guide to Google Apps integration, provisioning, and sync. The integration between Directory-as-a-Service and Google Apps works as follows. 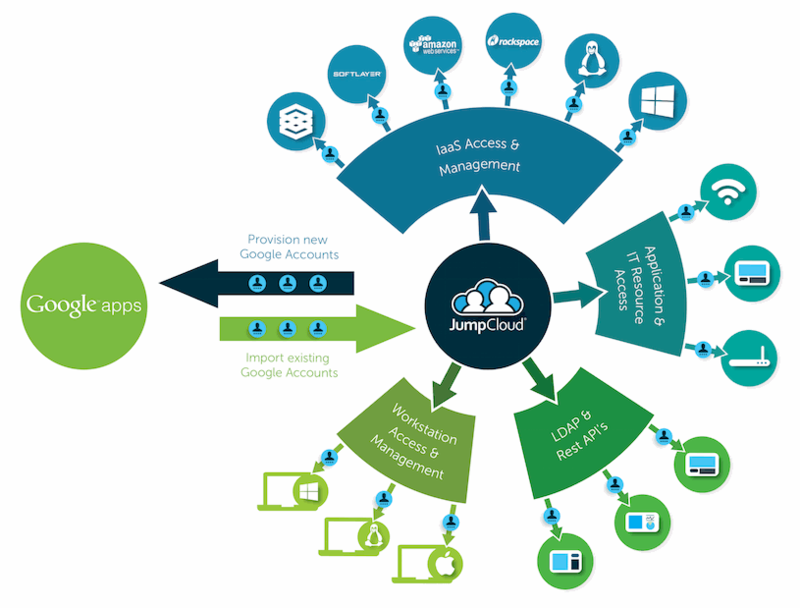 If needed, an IT admin can import all their users into the JumpCloud directory service. 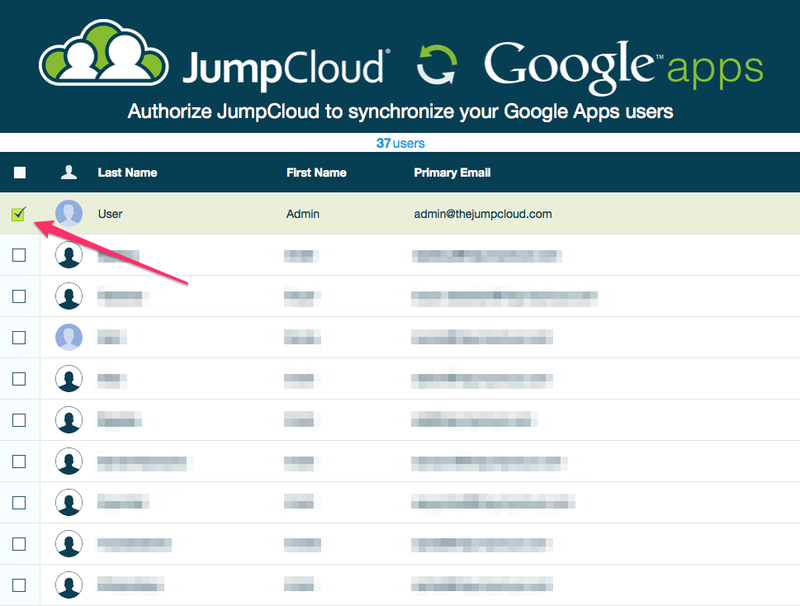 Users are asked to confirm their Google Apps password and, after authentication, JumpCloud is able to become the authoritative directory. 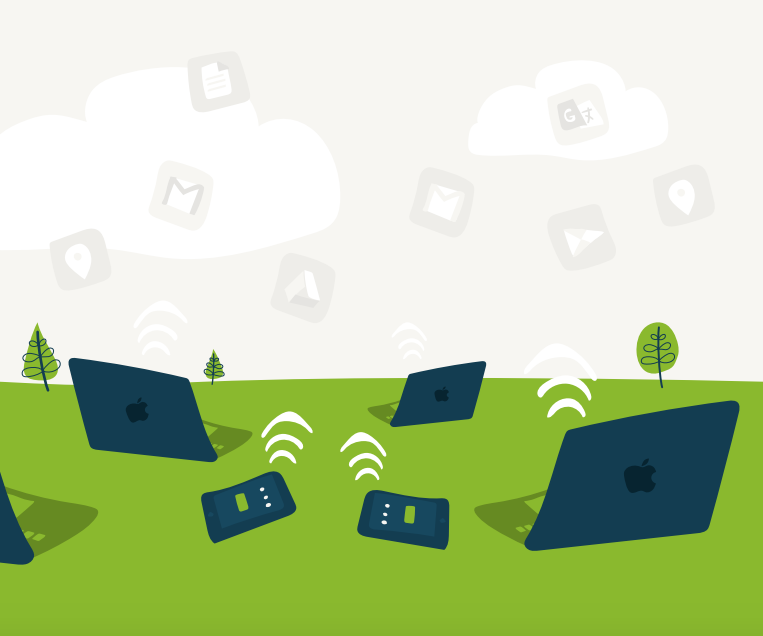 A user’s account can now be provisioned and managed on their Windows, Mac, or Linux system; on cloud servers at AWS or Google Compute Engine; with LDAP-based applications such as OpenVPN, MySQL, or Docker; and connected to an organization’s WiFi infrastructure to enable authentication to the WiFi network. In short, a user’s Google Apps credentials are federated to all of the IT resources they need, including systems, applications, and networks. For many organizations, this is a significant step-up. Most organizations struggle with how to completely integrate Google Apps into their IT infrastructure. Some have chosen to let it be an island while they manage users in GApps and elsewhere. Others have chosen to utilize legacy directory services such as Microsoft Active Directory and OpenLDAP. Unfortunately, that puts them in a position to have one foot in the cloud and one foot on-prem. However, with a cloud-hosted directory service as a companion to Google Apps for Work, IT admins can look to shift their entire infrastructure to the cloud. That means increased agility, more efficient IT, and less cost for most organizations. 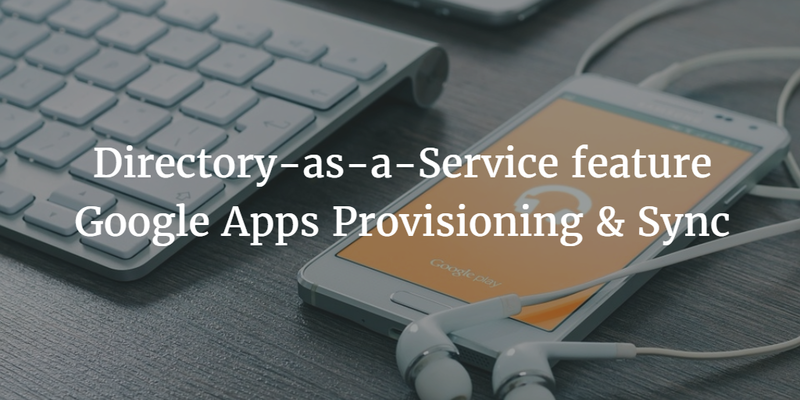 If you would like to learn more about how Directory-as-a-Service can support your GApps provisioning and sync needs, drop us a note. Please feel free to give JumpCloud’s cloud identity management platform a try. Your first 10 users are free forever.